KNM-KP 29281 is an adult mandible that includes all teeth, but lacks the rami. The teeth show canines that have long and very robust roots, and thick molar enamel. This specimen reflects similarities to older fossil specimens from Laetoli in the size of the canines, as well as the flare of the molars and the vertically implanted maxillary canines1. This mandible is relatively small and narrow, which is similar to the Miocene ape condition. Compared to Au. afarensis, KNM-KP 29281's tooth rows are straighter and more parallel, and show larger canines relative to cheek tooth size and a single cusp on the lower first premolar (Au. afarensis exhibits either one or two cusps)2. In addition, the anterior surface of the Au. anamensis mandible recedes significantly, and the mandibular torus is heavily developed, and lengthened posteriorly2. 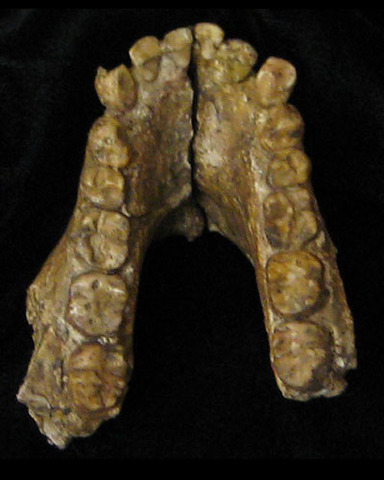 Overall, this mandible appears primitive in comparison to later australopiths, and shows many similarities with the mandibles of Miocene apes2. This species may be a direct descendant of the 4.4 Ma Ardipithecus ramidus, but the relatively thick enamel seen in KNM-KP 29281, as well as the proportions of its teeth, suggest dietary and/or masticatory differences between Au. anamensis and Ar. ramidus1. Au. anamensisis, however, commonly believed to be the direct ancestor to Au. afarensis1.